Carol and Robert Auld open new Kutamba AIDS Orphans School. When Carol Auld was given the idea of visiting Africa, particularly an AIDS Orphans school in Uganda, she had no idea what to expect. She did not know much about Uganda when she finally set off on her maiden trip to Africa in April 2007. What turned out to be a long trip to Uganda changed her life. After she visited Kutamba AIDS orphans in Nyakishenyi, Rukungiri District, she became more concerned and committed herself to improving the situation at the school on which the futures of many orphaned children is hinged. Observing the footpaths paths that led to the two-roomed, semi-finished building that housed the orphanage, kids seated on worn out wooden benches, trying their best to read in windowless buildings told Carol volumes about what needed to be done to help these kids. It was hard to compare this school with those in her native Colorado, her hometown where neat buildings, a library, good compound, comfortable seats and the like are a must for any school. 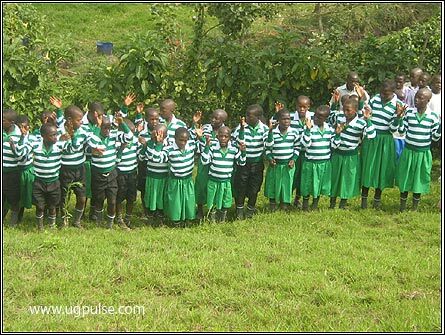 Kutamba Aids Orphans School was begun early in 2007 by the Nyaka Aids Foundation to provide free education, scholastic materials, food and health care to HIV/AIDS orphans. The school is the second to be established by the foundation, following Nyaka Aids Orphans School located in Nyakagyezi, Kanungu District. Each of the schools admits 30 orphans every year. Nyaka Aids Orphans School, which started in 2001, now has over 210 orphans, with the first lot of 30 set to sit for their national Primary Leaving Examination at the end of 2008. The two Aids Orphans Schools are a brainchild of Jackson Twesigye Kaguri, who lives and works in the USA. Twesigye mobilized friends in Uganda and in the US to start the Nyaka Aids Foundation to raise funds and provide education to the increasing number of orphans left behind by people who die from HIV/AIDS. Starting with one classroom, the organization built the Nyaka project into a fully-fledged primary school. Twesigye's resolve yielded another school in Rukungiri, which started with two classrooms last year. Twesigye met Carol and her husband Robert Auld, through a mutual friend, Carol Realini, who works with Global Giving, a non-governmental organization based in Washington DC in the United States. The couple had always wanted to undertake a charity project in Africa and were introduced to the idea of supporting the Nyaka Aids Foundation by availing education to AIDS Orphans. The Aulds agreed to the idea and after further discussions on phone and a flurry of emails, Carol decided to visit Uganda in April 2007 for the first time to see the children that needed her help to secure their future. For 10 weeks, she settled in the environs of the remote Kanungu District, brainstorming with Jackson and the Nyaka Foundation members via telephone on what support could be rendered to the children at Kutamba Aids Orphans School, given that the first school was now firmly established. Eventually, the plan to build a permanent school for Kutamba was formed. 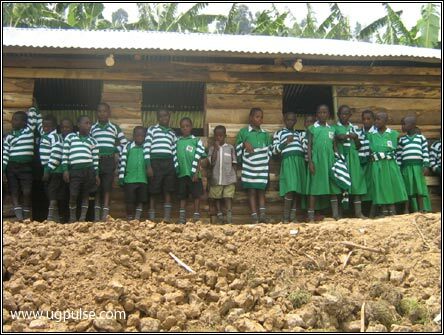 On returning to the USA, Carol embarked on a vigorous campaign to seek sponsors for the project and fundraise for money to build the school structure as well as contribute to other facilities that the school required. She met Jackson for the first time on August 3, 2007 in Denver, Colorado to discuss the specifics of building the school. With a preliminary budget made, the next step was to look for funds to kick-start the school project. In September 2007, Carol and Robert organised the first fundraising drive in Colorado. With a crowd of friends, relatives and well-wishers, they managed to raise about 65 million shillings (40,000 US Dollars). Excited with the success of the fundraising, they organised a second fundraising drive in December 2007 and over 146 million shillings (90,000 US Dollars) was raised. "The money was more than we had anticipated. The fundraising increased our enthusiasm and energy to embark on the building project for the orphans," says Carol, who is currently in Uganda to oversee construction of the school building. After raising the money, Carol and Jackson embarked on partnering with other people to work on the project. A group of Jackson's friends from Indiana was interested in working with Nyaka Aids Foundation. One of these was Pastor Pontius Brad of Sherwood Oaks Church, who met Jackson while attending a Christian men's fellowship. "Jackson and I had had earlier discussions about Nyaka School and as a church, we wanted to develop programs that target AIDS orphans," says Pontius. The Indiana group, comprising of Pontius, Otto Ray, Eric Rudd, Cynthia Parkes and Whitney Gates decided to partner with Carol and Robert to bring the project to life. In February 2008, the two groups separately came to Uganda and met for the first time for a united cause - to build Kutamba AIDS Orphans School. Sunday February 3, 2008 is a day that the residents of Nyakishenyi Sub-county, Rukungiri District will never forget. It was all smiles and excitement as pupils, parents, guardians and the visitors came together to witness the historic event that will forever be remembered for giving ample hope to the future of many children in the area. The orphans, their guardians, community members and their leaders gathered to witness the laying of the foundation for the new Kutamba AIDS Orphans School by the Aulds. Pupils of Kutamba entertain the visitors. Despite news that the intended guest of honour, Prof. Mondo Kagonyera, the Chancellor of Makerere University and Deputy Director of the National Social Security Fund would not make it due to health reasons, this did not kill the mood within the crowd. The smartly dressed girls in their green dresses and the boys in their green shirts and black trousers could hardly hide their joy as they heartily sang songs for the visitors. The Kutamba mukaka (grandmothers) group sang a traditional welcome song for the visitors, prompting two of them to join in the vigorous okutagurura - engaging in the Kikiga traditional dance. It was a spectacle to behold as the Bazungu tried the energy consuming jumps and arm-swaying characteristic of okutagurura. After the dance, Carol and Robert were invited to break the ground, which they did, amidst ululations. However, this was not before Pastor Pontius prayed to God to bless the land on which the school is built. He later laid the first brick, followed by the rest of the team. The Nyakishenyi Local Council chairperson, Boney Biryatuyita was all praises for the US team for stretching out a helping hand to the orphans of Uganda. "Because of your goodwill and mercy, the children of Nyakishenyi are going to benefit a lot from Kutamba School," he said. He called upon the local community to throw its weight behind the project since jobs are going to be locally availed to them as a result. Matthew Miller, an architect from Architecture for Humanity, a global organization that helps design structures for disadvantaged communities around the world, was at hand to help Kutamba to design and manage the school structure. Kutamba Aids Orphans School has brought untold happiness to many orphans like Darius Ainemani. Ainemani, a Year 3 pupil at Kutamba, says that the school is a blessing from God. Having lost both parents when he was three years old, the twelve-year-old has been living under the care of his elder brother until Kutamba came along. Ainemani says that his education stalled for years due to lack of school fees. When Kutamba Aids Orphans School was established at the beginning of 2007 to offer free education to children orphaned by HIV/AIDS, he jumped at the opportunity and today, he is one of the best performers in his class. "With the building of more classrooms at Kutamba, I can be assured of completing my primary school education," he says with a huge smile. He is assured education for only the remaining few years of his primary education. 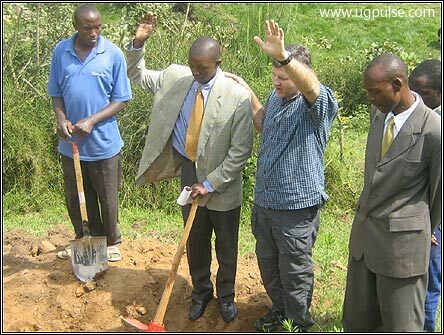 Pastor Pontius prays for the land on which the school is being built. What about life after Kutamba? In as much as the Aids orphans' school project has met deserved excitement, uncertainty looms about the future of the children - that beyond their primary education. "I do not know if I will continue on to secondary school. My elder brother says that even if I complete primary school education, he may never get enough money to fund my education further," says Ainemani. The headmaster of Kutamba Aids Orphans School, Eric Akatwijuka, admits that the children's guardians have on several occasions, asked him about their future after Kutamba. "Many of the guardians are concerned about the future of these children," Akatwijuka says. "These guardians are very poor and depend on Kutamba for help, especially education, food and health," he adds. Carol Auld believes that all these challenges will get answers one at a time. She says that the money raised for the school buildings is more than enough and may be channeled towards a fund for the orphans studying at Kutamba. "Whatever money is left from the building project will definitely go towards that fund," she says. After the US team left Kutamba, they sat down to brainstorm and within minutes came up with other ideas to contribute more to the Nyaka Fund. Pastor Pontius, who had all the while been keeping in touch with his church about the groundbreaking event, says that when they get back to America, they will set up a coffee shop as part of this effort. A Ugandan theme night will be set every month at the shop, where proceeds from every cup of coffee sold that day will go to the Nyaka fund. "We want our patrons to know that they are buying a simple cup of coffee for a cause. Their time and money will be changing lives in Uganda," says Pontius. Pontius contends that the project will be long term but promises more commitment to the Nyaka and Kutamba children. Sherwood Oaks Church makes monthly contributions to the Nyaka Fund and has already sent 5000 US Dollars for the purchase of a school van. The church is also conducting teacher-training courses for the Kutamba and Nyaka teachers so that they are equipped with better computer skills. Carol and Robert have also partnered with Nurses with a Purpose, an NGO in Colorado to bring nurses to Uganda during the last two weeks of March 2008. The 12 nurses will hold mobile clinics in Kutamba and Nyaka. "These clinics will not only benefit the children but the surrounding communities as well," Robert Auld says. What comes next for these AIDS orphans after graduating from Kutamba? That aside, the Nyaka AIDS Foundation is looking for sponsorship for the children. Twesigye has already embarked on a project to partner with other NGOs and individuals to sponsor the children's education beyond primary school level. Abubkr Ssempa, the National Coordinator for Nyaka Aids Foundation says that they are planning to start a vocational school where the children can get practical skills that they can depend on to earn a living. The organization is looking at building more partnerships and friendships, locally and internationally to improve on what is currently being offered to orphans at the two schools.